Gabriele Koch potter and ceramicist, born in Germany. After completing an English course at University in Germany, Gabriele Koch moved to Britain in 1973 initially to teach languages. She began an evening course in ceramics at the Camden Institute and decided to do a degree at Goldsmiths’ College. 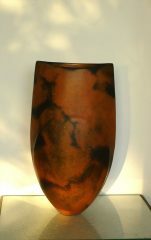 In 1980’s she began making pots in earnest and the first pot she sold was to the sculptor Anthony Caro. 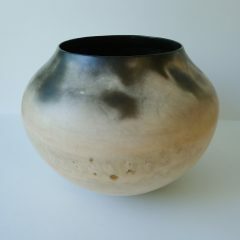 In 1982 she applied and received a ‘Setting Up Grant’ which allowed her to buy a gas kiln for her studio. She had her first show in 1984 at Oliver & Pink Gallery in Chelsea which was well received and gained interest from other galleries keen to exhibit her work. In the late 1980’s she began lecturing at Farnham School of Art. 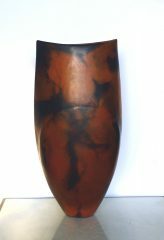 From her studio in North London she developed a distinctive style of hand building and smoke-firing, creating instantly recognisable forms and vessels. Her recent work has changed from low fired earthenware to high fired stoneware, combining rough black clay with white porcelain, giving me the opportunity to create strong graphic designs in contrasting colours. Her works reside in some of the most prestigious international public and private collections.